Perl is one of the most popular scripting language. It is easy to learn and you can do lot in less amount of code. If you’ve used ruby then there is rails, sinatra, etc, for python Django is there and similarly for php there is cakePHP etc. 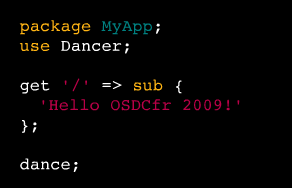 Dancer is a cool web development framework in perl, heavily inspired from Sinatra (web micro-framework for ruby). it’s a free and open source software (available under GPL). Previous PostMac OS X Theme for Ubuntu 12.04 LTSNext PostLinux Mint 13 – “Cinnamon” : Desktop Experience Reloaded! This looks interesting. BTW, nice blog!